This is a bit of a different review for us here at Pure Nintendo but one that I think will be valid for those who own a Wii U Pro Controller and want to use it on their PC too. I’ve always been a huge fan of using the mouse and keyboard for PC games especially first person shooters. In recent years though, there have been more console to PC ports where I feel controllers have the advantage. Maybe not the advantage on precision, but certainly the advantage on comfort. I’ve been recently hooking up my PC to a TV to play games and it’s always a bit of a process to hook up my gaming mouse (which is still a wired one), my bluetooth keyboard, and the computer itself. Sitting on a couch playing games is so much more comfy with a controller in my opinion and that’s where Mayflash’s adapter comes in. For us Nintendo fans, we may not own a separate Xbox One/360 controller. I only own a Wii U so my options are a bit more limited than if gamers had an Xbox controller which already interfaces with PC’s pretty easily. If you’ve tried to sync up your Wii U Pro Controller to a PC in the past, I’m sure you’ve found it to be a tedious process. You basically have to install a new Bluetooth stack (by Toshiba) in order to get it to sync correctly and be recognized as an Xbox controller. There is no ‘native’ support for the Wii U Pro Controller on PC’s so it simply masquerades as an Xbox controller. Thankfully the button layout is very similar and buttons are mapped 1-to-1 (X button is the X, A is the A, and so on). I tested the adapter with the following PC games: Tomb Raider (worked perfectly), Spec Ops The Line (Left stick was oddly inverted and couldn’t fix), Dishonored (worked perfectly), and Far Cry 4 (worked perfectly). So how easy is the Mayflash adapter to setup? Well, as easy as it gets. I simply took the adapter out of the package, plugged it in to a USB port, then pressed the sync button on the Wii U Pro Controller and the adapter, and that was it! Most any game will now see your Wii U Pro Controller and allow you to play games using it, even with rumble support. 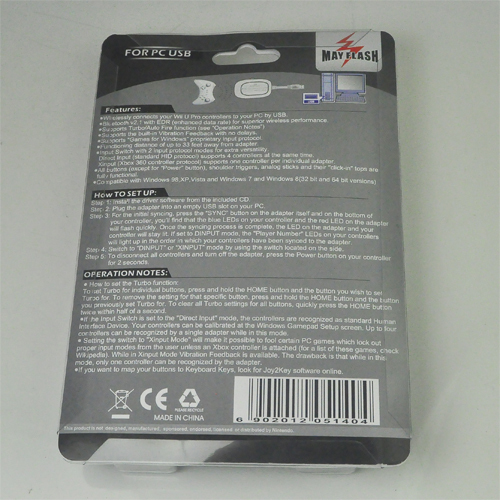 One other feature of the adapter is a switch that changes from D-input to X-input. In order to emulate an Xbox controller, use the X-input. The D-input option is if you want to use your Wii U Pro Controller on a PS3. Not sure exactly why you’d want to do that, but it allows for that option (only without rumble support). The build quality of the device is very solid. It has a long cable just in case you’ve got it hooked up to a PC in your entertainment center and need to move it around to get a better spot. I’ve just kept the wire ties on it since it keeps it nice and compact. 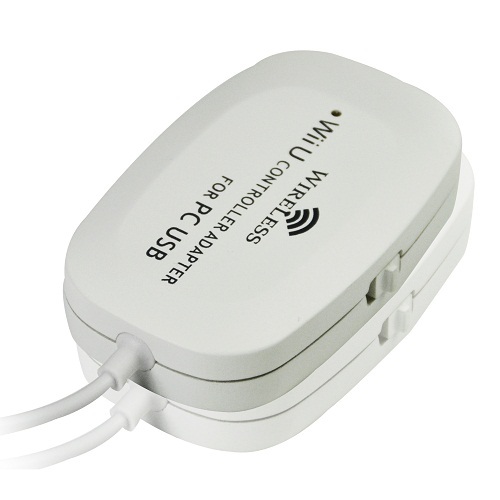 The device only comes in a white color which looks alright. It would be cool to have some other color options like black which fits in with the rest of my electronics, but it’s not a huge deal. Overall, I’ve been very pleased with the adapter. From it’s simple setup to its cheap price, you really can’t go wrong. 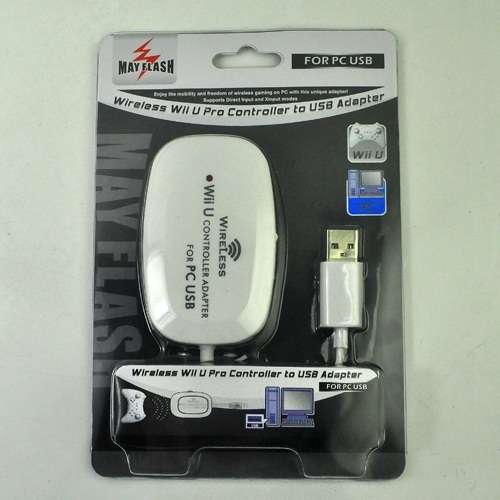 If you’re like me and want to use your Wii U Pro Controller for PC games, you will love the Mayflash Wii U Controller Adapter. 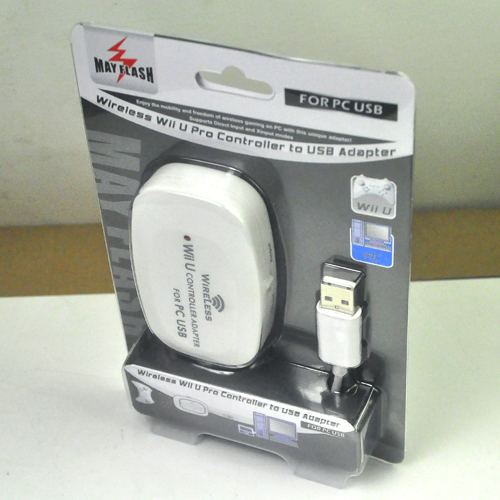 If you’d like more setup information or information about the adapter, check it out at the link below.